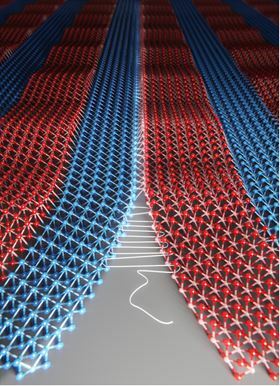 Scientists from the University of Chicago and Cornell have demonstrated a technique for “sewing” two crystal lattices seamlessly together at the atomic level to produce atomically thin fabrics. The resulting single-layer materials are thought to be the most perfectly aligned ever grown, as their smoother transition means that where the two lattices meet, one stretches or grows to meet the other, leaving no holes or other defects. Such production of high-quality heterostructures at the atomic-thickness limit could lead to innovations in electronics, bringing new configurations including flexible LEDs or atom-thick 2D circuits that work both horizontally and laterally, making such devices much thinner and lighter. The smoother the seam between materials used in electronic devices, the easier it is for electrons to flow across them, which is key to their functionality. However, these materials are comprised of crystals, rigid lattices of atoms that can have very different spacing, so joining them together is problematic. In this new research, as published in Science [Xie et al. Science (2018) DOI: 10.1126/science.aao5360], the team managed to stitch different fabric-like, three-atom-thick crystals. This type of material tends to be grown in stages under different conditions, by growing the first material and then stopping the growth, before altering the condition and starting again by growing another material. Instead, this approach identified the best window for both materials in a constant environment to allow for growing the whole crystal in a single session. The atomic seams are so tight that when observed by a scanning electron microscope, the larger of the materials can be seen to pucker around the joint. Performance was assessed on a diode, where two different kinds of material are joined and electrons can flow one way through the “fabric” but not the other. The diode was found to light up. As first author Saien Xie said, “It was exciting to see these three-atom-thick LEDs glowing. We saw excellent performance – the best known for these types of materials”. The stretching and compressing involved also altered the optical properties – the color of the crystals due to the quantum mechanical effects – offering the potential for light sensors and LEDs tuned to different colors, or strain-sensing fabrics that alter color when stretched. As lead author Jiwoong Park said “This is so unknown that we don't even know all the possibilities it holds yet. Even two years ago it would have been unimaginable”. The researchers are now working to include more material components to the heterostructures to produce “atomic fabrics” with a range of enhanced functions and, for device technology, they plan to further develop color-tunable, highly efficient LEDs and strain sensors based on the fabrics.